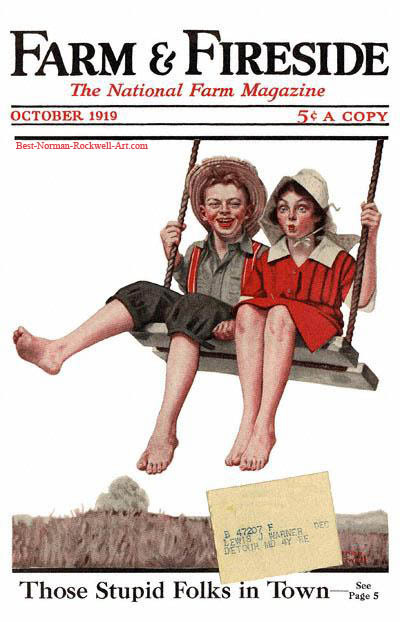 Boy and Girl Swinging, this Norman Rockwell painting, appeared on the cover of Farm And Fireside published October 1919. This was the fourth cover by Rockwell to appear on Farm And Fireside. Only five Rockwell covers were published by this magazine. Rockwell only submitted to this smaller magazine after the bigger publishers had rejected the cover illustration. Plainly, Rockwell's preference and first choice of publication was The Saturday Evening Post. He believed, and his career proved, that the Post cover was America's biggest showcase window for artists. I remember having a swing like that. It was just a rope and a board with a notch cut into each end. And when we played so rough that the board broke, we would just swing sitting on the naked rope itself. Here's more about Farm And Fireside covers by Norman Rockwell. Rockwell does a fine job of enabling us to relive those childhood memories. Here we see a boy and a girl swinging in the same rope and board swing. Presumably, this was an era before government-mandated "safety" regulations on children's playground equipment. It appears that they are swinging from a high tree. Rockwell doesn't even paint any leaves or branches, so the rope must be a long one. The longer the rope, the higher and faster the swing. Typical of the stereotypes of the day, the boy and girl each show different facial expressions. The boy looks entirely comfortable flying through the air. He doesn't even seem worried about his hat flying off. He has a big grin on his face and is looking directly at us, the viewer. The girl, on the other hand, seems to be saying "Ooooh!" Her lips are pursed. Her eyes are directed straight ahead and down, presumably at the ground, as if to make sure it doesn't get any further away. Her bonnet is tied to her head. She is holding on to the swing and rope with both hands. Most telling is that she is not swinging her legs to make the swing go higher and faster. We can see a field full of wheat in the background, as well as a tall tree and a mountain. Sorry about the mailing label. Rockwell Farm And Fireside covers are rare collectibles and very hard to find. I am pleased to even own one with a mailing label. Please contact me if you have any to sell .